Add in a smoky something extra to your favorite meals with our bold Cheddar Chipotle Menu Flavors. A perfect way to spice up a classic like our Chipotle Mac & Cheese. Cheddar Chipotle Pasta is rated 4.1 out of 5 by 36. Rated 5 out of 5 by Sammy44688 from Loved it! I recently came across this flavor at my local store, and noticed it was on sale to be discontinued. I picked up 4 packages, having never tried this before, and i used two packs with kelbasa and a can of fiesta corn and cooked in one pot.... my mind was blown! My family and i loved it! Since then i have been going to every store in my state of Rhode Island and neighboring city's in Massachusetts that sell food and have not been able to find it. Please dont discontinue this product! I had only recently found this and want to keep making this! Is there any way i can still buy this? All in all great product! Rated 5 out of 5 by blahdonuts from Delicious! I have no idea what all the other reviewers who think this pasta dish is bad are talking about... 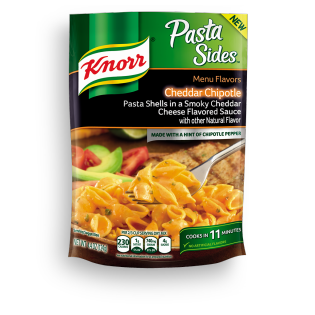 This has been my favourite so far out of all the Knorr pastas I tried. It has a very unique and zesty taste, and the fact that it comes with my favourite kind of pasta makes me love it even more. I normally cook it with mixed vegetables, and I love how tender the pasta is when you cook it at the right consistency.I've already had this a few times times. I do hope this isn't discontinued! IT IS ABSOLUTELY DELICIOUS. Rated 1 out of 5 by TK14 from Terrible Smell and Terrible Taste The Chipotle Rosa Rotini Pasta Sides product has become a regular purchase for me. It's fantastic! However, lately I haven't seen it in stores as much, and recently saw this Cheddar Chipotle in its place. I thought maybe it was a replacement or a "new" version of it. But I was wrong! As the other reviews have said, this product has an awful smell as soon as you open the package and the entire time while cooking it. When it's done, the taste contains the same essence of that terrible smell. I couldn't eat more than one bite and ended up throwing the rest of it away. Incredibly disappointing, and I hope to God that they don't get rid of the Chipotle Rosa in favor of this. Rated 5 out of 5 by Darian86 from I can add almost anything to it! This is honestly, one of the best Knorr products I've tasted. I always tend to spice it up with vegetables and shrimp, and it's amazing. When I shop at the grocery stores, I always tend to grab tons of it becuase it runs out pretty quick. I hope they never get rid of this flavor.